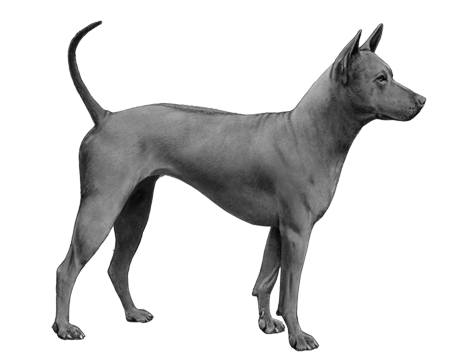 The actual origin of the Thai Ridgeback will forever remain a mystery. May be wary around strangers and can attempt to hunt other small animals. Will benefit from lots of early socialization. 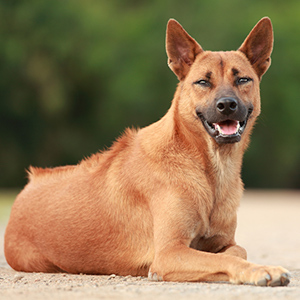 The actual origin of the Thai Ridgeback will forever remain a mystery, but as the name would indicate, the breed was developed in eastern Thailand. 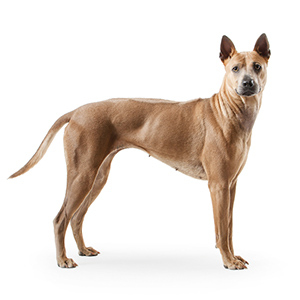 Based on genetic findings, the hypothesis is that both the Thai Ridgeback Dog and Phu Quoc Dog are likely to be descended from Funan Ridgeback Dog which originated over 1,000 years ago in Funan Era of the region. While the mutation that causes the ridge in the Thai and Rhodesian is the same, overall they have some remarkable phenotypic differences. 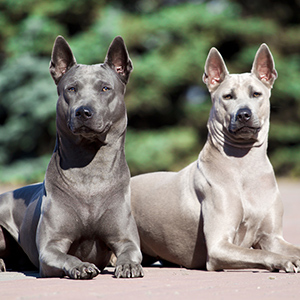 The Thai Ridgeback is a muscular, large-sized, pariah-type dog with a wedge-shaped head. 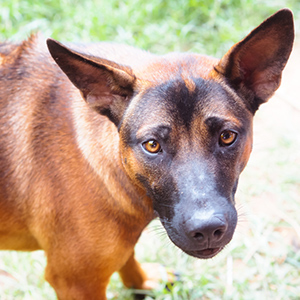 In contrast to the Rhodesian, they have triangular-shaped prick, or upright, ears, and their short, smooth coat is usually grey, blue, or black although some do have the red or fawn coloring with the black masking. Brindle and white coloring has also been reported, but are not considered acceptable breed standards. Due to the length and density of their coats, owners will be happy to note that coat shedding is rather minimal. It has a pronounced ridge on its back formed by hair growing in the opposite direction that extends from behind the withers to the hips. Eight distinctive ridge patterns have been identified: needle, feather, arrow, lute, violin, bowling pin, leaf, and saddleback. All these are considered acceptable for the breed standard, but they have to be clearly defined and symmetrical. The broader the ridge, the more highly it is prized. 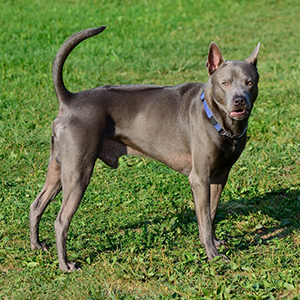 If they are properly socialized, the Thai Ridgeback can be a loyal, loving member of the family. As a guarding breed though, they are naturally protective of their home. This means they can be reserved and suspicious with strangers. Successful integration into the home requires a patient, consistent, and experienced owner with a good understanding of dog behavior.